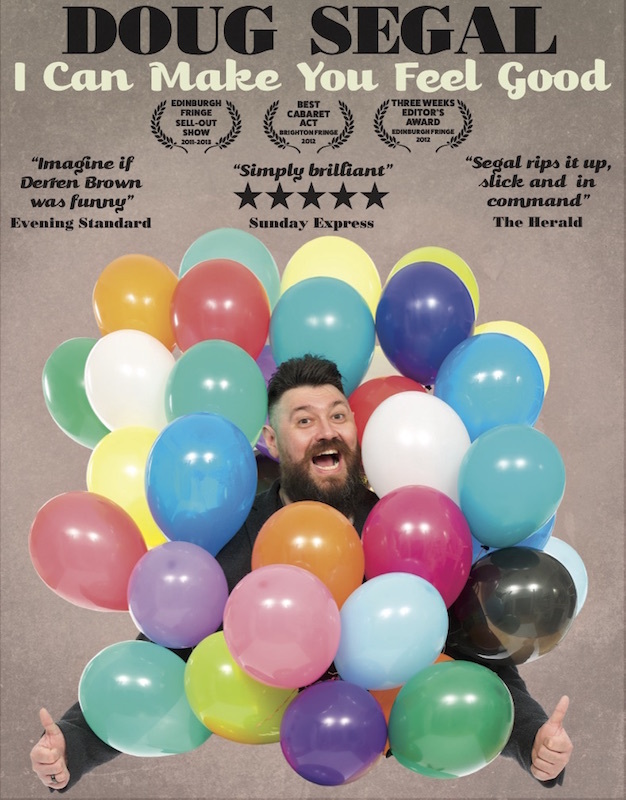 Following three sell-out Edinburgh Fringe runs, award-winning comedy mind reader Doug Segal is back with a brand new show to make you feel good. Using mind tricks to figure out what makes his audience happy, jokes to make them laugh and guaranteeing an endorphin rush for everyone. While other mind readers focus on being dark and mysterious, Doug thought ‘what’s the point of being “Britain’s best comedy mind reader” (The Skinny) if you can’t use your powers to make people experience happiness, even just for a while?’ Join Doug in an experiment in the science of happiness as he and the audience try to raise their serotonin levels! Doug Segal is not a magician, clairvoyant or a hypnotist. Everything he does is achieved though application of principles learned in his previous career spent working in advertising agencies. He employs persuasion techniques, statistics and insight into the way people think and make decisions, along with two key advertising skills: cheating and lying, all offered up with humour, rakish charm and a rock and roll attitude! Doug featured on BBC One’s New Year’s Eve show with Natasha Kaplinsky and Claire Balding on which his two live 10 minute spots were seen by a record 9.5 million live viewers. In 2012 Doug predicted the Olympics’s results live on BBC Radio Scotland. He has also appeared on BBC Three’s Mischief, BBC One’s The Slammer and was a regular guest on Holland’s highest rated chat show Jensen! (RTL5).